Definition at line 636 of file ctype.h. Definition at line 640 of file ctype.h. Definition at line 656 of file ctype.h. Definition at line 691 of file ctype.h. Definition at line 690 of file ctype.h. Definition at line 693 of file ctype.h. Definition at line 692 of file ctype.h. Definition at line 629 of file ctype.h. Definition at line 26 of file ctype.h. Definition at line 657 of file ctype.h. Definition at line 76 of file ctype.h. Definition at line 72 of file ctype.h. Definition at line 641 of file ctype.h. Definition at line 71 of file ctype.h. Definition at line 20 of file ctype.h. Definition at line 39 of file ctype.h. Definition at line 79 of file ctype.h. Definition at line 67 of file ctype.h. Definition at line 73 of file ctype.h. Definition at line 650 of file ctype.h. Definition at line 643 of file ctype.h. Definition at line 642 of file ctype.h. Definition at line 653 of file ctype.h. Definition at line 695 of file ctype.h. Definition at line 694 of file ctype.h. Definition at line 646 of file ctype.h. Definition at line 652 of file ctype.h. Definition at line 645 of file ctype.h. Definition at line 651 of file ctype.h. Definition at line 649 of file ctype.h. Definition at line 648 of file ctype.h. Definition at line 644 of file ctype.h. Definition at line 683 of file ctype.h. Definition at line 676 of file ctype.h. Definition at line 686 of file ctype.h. Definition at line 697 of file ctype.h. Definition at line 696 of file ctype.h. Definition at line 679 of file ctype.h. Definition at line 685 of file ctype.h. Definition at line 678 of file ctype.h. Definition at line 684 of file ctype.h. Definition at line 682 of file ctype.h. Definition at line 681 of file ctype.h. Definition at line 677 of file ctype.h. Definition at line 680 of file ctype.h. Definition at line 647 of file ctype.h. Definition at line 75 of file ctype.h. Definition at line 66 of file ctype.h. Definition at line 70 of file ctype.h. Definition at line 68 of file ctype.h. Definition at line 654 of file ctype.h. Definition at line 655 of file ctype.h. Definition at line 65 of file ctype.h. Definition at line 342 of file ctype.h. Definition at line 660 of file ctype.h. Definition at line 742 of file ctype.h. Definition at line 745 of file ctype.h. Definition at line 744 of file ctype.h. Definition at line 671 of file ctype.h. Definition at line 664 of file ctype.h. Definition at line 675 of file ctype.h. Definition at line 674 of file ctype.h. Definition at line 667 of file ctype.h. Definition at line 673 of file ctype.h. Definition at line 666 of file ctype.h. Definition at line 672 of file ctype.h. Definition at line 670 of file ctype.h. Definition at line 669 of file ctype.h. Definition at line 665 of file ctype.h. Definition at line 668 of file ctype.h. Definition at line 624 of file ctype.h. Definition at line 743 of file ctype.h. Definition at line 16 of file ctype.h. Referenced by isblank(), isleadbyte(), and iswctype(). 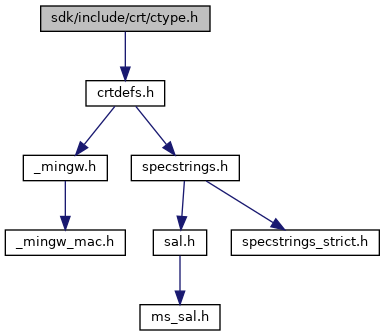 Referenced by _mbstowcs_l(), and _mbtowc_l(). Referenced by _ismbbalnum(), check_for_punctuation(), checkeql(), Close(), dup_basename_token(), ExpandTilde(), Format(), gen_name(), gl_display_matches(), IsFourCCFormat(), isurlneutral(), make_token(), NetBTinetResolve(), Open(), ParseURLA(), PathGetCharTypeW(), Protect(), read_header_file(), readstdin(), Save(), strxlen(), TREEVIEW_ProcessLetterKeys(), TRIO_ARGS4(), Unlink(), RequestHandler::urlenc(), and wine_dbgstr_fcc(). Definition at line 4 of file isblank.c. Referenced by _Locale_init(), DwordEditSubclassProc(), FTPListToMemory2(), HelpCmd(), TANSIParser::ParseANSIBuffer(), TANSIParser::PrintGoodChars(), TScroller::ScrollBack(), split(), TANSIParser::StripBuffer(), and TRIO_ARGS4(). Referenced by _ismbbgraph(), compress_block(), gen_codes(), and TRIO_ARGS4(). Referenced by _Locale_init(), TRIO_ARGS4(), and UnDosLine(). Definition at line 4 of file iswblank.c.